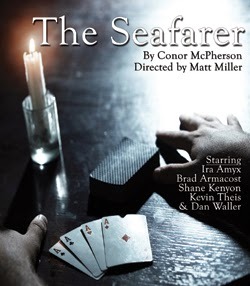 Seanachaí Theatre Company is pleased to kick-off its 2013-14 season with Conor McPherson’s Tony and Olivier Award-nominated drama THE SEAFARER directed by Matt Miller and featuring ensemble members Ira Amyx, Brad Armacost, Shane Kenyon, Kevin Theis and Dan Waller. THE SEAFARER plays November 27, 2013 – January 5, 2014 at The Den Theatre, 1333 N. Milwaukee in Chicago. Tickets are available at www.seanachai.org or by calling (866) 811-4111. On Christmas Eve, a pair of brothers are set to enjoy the holidays in true Dublin spirit with cards, booze and friends – until a stranger from long ago arrives to collect a debt. THE SEAFARER is an eerie and darkly humorous masterpiece from one of Ireland’s most celebrated playwrights. The production team for THE SEAFARER includes: Joe Schermoly (scenic design), Beth Laske-Miller (costume design), Julian Pike (lighting design), Stephen Ptacek (sound design), Elise Kauzlaric (dialect design), Seanachaí ensemble member Jeff Christian (production stage manager), Rebecca Willingham (assistant director) and Andrew Donnelly (stage manager). Cast: Seanachaí Theatre ensemble members Ira Amyx (Ivan), Brad Armacost (Richard), Shane Kenyon (Nicky), Kevin Theis (Mr. Lockhart) and Dan Waller (Sharky). Regular run: Saturday, November 30, 2014 – Sunday, January 5, 2014. Note: there will not be a performance on Thursday, November 28 (Thanksgiving). Tickets: Previews $12. Regular run $26 Thursdays & Fridays, $30 Saturdays & Sundays. Seniors/students $5 off. Tickets are available at visit www.seanachai.org or by calling (866) 811-4111. Group discounts (8 or more) are available by calling (773) 878-3727. Conor McPherson is one of Ireland's premier contemporary playwrights, currently produced worldwide, in London's West End and on Broadway to both critical and audience acclaim. His plays include The Veil (premiered at the Royal National Theatre October 2011, directed by the author), The Weir, The Seafarer, Port Authority, St. Nicholas, Shining City and Dublin Carol. The New York Times proclaimed him "the finest playwright of his generation." His new play, The Night Alive premiered at the Donmar in June 2013. Originally from Kent, Ohio, Matt Miller is a Chicago based director and teacher. His previous credits with Seanachai Theatre include The Weir and a joint production of St. Nicholas with Shanghai Low Theatricals. Other recent directing credits include The Killer Angels with Lifeline Theatre, Superior Donuts with Mary-Arrchie Theatre Co., Oblivion and 4000 Miles (staged reading with Deanna Dunagan) for Steppenwolf’s First Look Repertory, A Girl With Sun In Her Eyes and This Is Our Youth with Pine Box Theater, and the world premiere of Graceland with Profiles Theatre (Jeff Award winner, Best New Work). Matt is also a proud fifteen-year company member with Barrel of Monkeys, a theatre group that provides creative writing workshops for Chicago Public Elementary Schools that lack arts funding. Seanachaí is the Gaelic word for Storyteller. It was the duty of the Seanachaí to keep these stories alive. The mission of Seanachaí Theatre Company is to return theatre to this origin - by creating compelling productions and programs that focus the energy of artists towards the common goal of exceptional storytelling. To achieve this end, Seanachaí Theatre Company strives to provide an atmosphere where all theatre artists – actors, playwrights, directors and designers – have the support and assurance to collaborate openly.